You don't have to limit your decorating to walls when you can get this Retro Floral Horse Window Picture. It is the perfect accent for that room for a teen or tween girl who is crazy about horses. 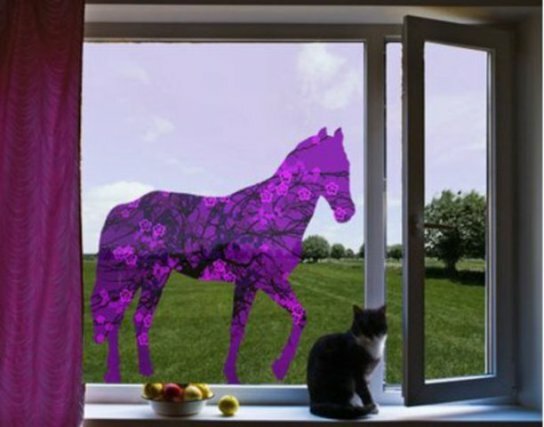 Enhance that boring view outside your window with a horse of a different color. This purple pony is a real eye-catcher. Suitable for any glass or mirror surface. Get creative and use one on that glass table top or decorative mirror. Available in a variety of sizes. The soft and pliable vinyl is water-resistant and won't fade. Clean just as you would any window. Easy to install. For more information or to order, click here.